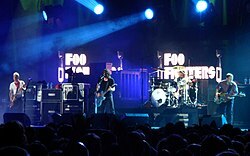 Foo Fighters performing in November 2007. Foo Fighters is an American rock band started by musician and former Nirvana drummer Dave Grohl. The band was formed in 1994. The band's name comes from a term used in World War II about strange sky objects (UFOs). The band, who have achieved a world-wide following, have won many awards for their music, and have released seven studio albums and twenty-eight singles. Foo Fighters have won eleven Grammy Awards. The current members of the band are Dave Grohl (singer), Nate Mendel (bass guitar), Taylor Hawkins (drums) and Pat Smear (guitar). Before Grohl was a member of Foo Fighters, he was the drummer for the popular grunge band, Nirvana. Nirvana's singer, Kurt Cobain, died about one year before Foo Fighters were formed. This page was last changed on 21 May 2018, at 07:41.